The Sierra Madre Tattler! : How Do You Know They're Going To Raise Taxes In Arcadia? City Hall Has Formed A "Citizen’s Financial Advisory Committee"
How Do You Know They're Going To Raise Taxes In Arcadia? City Hall Has Formed A "Citizen’s Financial Advisory Committee"
Ah yes, "The Process." Like Arcadia doesn't already know how much they owe, or how much more in tax money they need. Such a tiresome old phony baloney show of an act. Rather than just tell the truth about the city's immense debt, or how things got as bad as they have, instead we get the "Citizen’s Financial Advisory Committee." People specially selected to come to a conclusion the city really wants, but lacks the honesty and courage to say themselves. You need to pay more taxes. The Arcadia Weekly has an article up on their website about this predictable and hardly novel nonsense. The sales pitch from City Manager Lazzaretto is particularly cloying, and not exactly honest since never dares to say why Arcadia is so deeply in the red. Even though he clearly knows the reason why this is. Here is a brief, though bitter, taste. Arcadia Convenes Citizen’s Financial Advisory Committee (Arcadia Weekly link): The Citizen’s Financial Advisory Committee recently held its first meeting to review the City’s long-term financial forecast and to begin its import work to provide recommendations to the City Council regarding the City’s financial future. The committee is composed of five long-time Arcadia residents with backgrounds in financial management and planning and is tasked with making recommendations to preserve Arcadia’s excellent city services, including cost-containment measures, opportunities for efficiency, and potential sources of locally-controlled funding. You get all of that? The always composed Dominic Lazzaretto is talking out of his vastly overcompensated golden keister about city finances. And why shouldn't he want to do so? He stands to benefit personally from any increase in taxes to the residents of Arcadia. Dominic is singing for his supper. Or, more likely, the posh six figure CalPERS pension he plans to start living off in the not too distant future. Money that he could start collecting in less than a decade. Chances are Dominic has already picked out his Winnebago. Let's save the "Citizen’s Financial Advisory Committee" a lot of time and effort and get straight to the point. This is about Arcadia's massive CalPERS debt. Do you want to see a very big number? 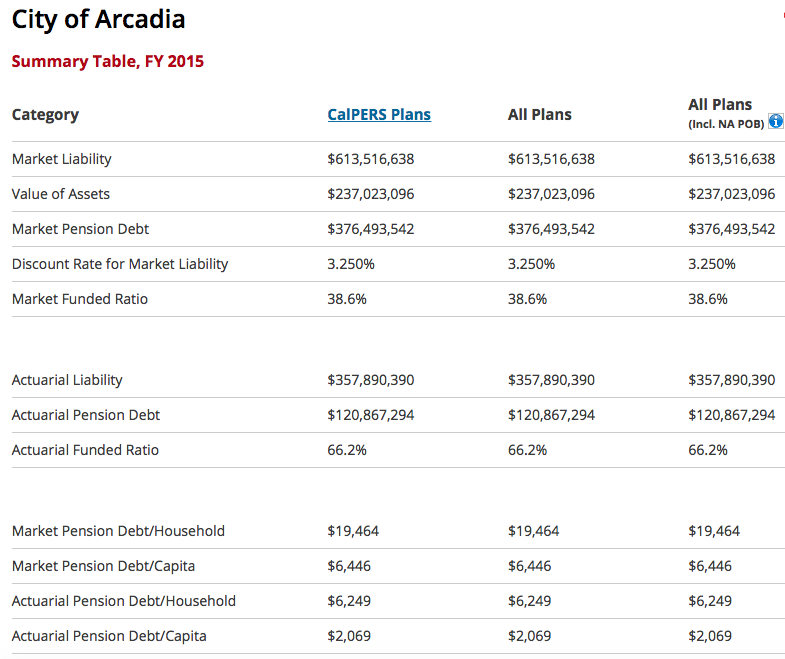 According to a Stanford University website called the California Pension Tracker, as of 2015 Arcadia owes CalPERS well over $613,000,000 million taxpayer dollars. OK. So now you can send the advisory committee home. Give them a cookie, a handsome certificate, a pat on their stalwart heads from the Mayor, and call an Uber and forward them to their last known address. Here is a chart that Stanford University website has provided for you. Link here. Do you know what would be fun? Put Roger Chandler, Bulldozer Bob and Sho Tay in front of the people of Arcadia and have them explain how they managed to put the city so deeply into dutch with CalPERS. All of that benefits money they shoveled to the likes of the cop union in exchange for campaign political endorsements has obviously added up. If the people of Arcadia are going to be asked to fork over more money, shouldn't they at least get a little truth in exchange? Well, there it is. But don't expect to hear any of that from City Hall. They think its their own personal money, and would be offended if you asked. Noticing the CalPERS elephant in the room would be an example of the kind of uncivil behavior the city is fighting so hard to eradicate. You are required to believe the additional money is needed for peacock grooming and Lucky Baldwin statue polishing. Sierra Madre had an advisory committee made up mostly of Fire Department family-friendly residents. The conclusion, without taking into account that the Paramedic Program was never funded, the town needs more money. Talk about grooming peacocks! This is plainly manipulation. Rather than having those who are paid to run city govt ask for a tax hike, or heaven forfend the elected officials, instead have actual tax payers do it for them. How very sad this is. Why is Mickey Segal, former mayor and chair of the City’s previous Citizen’s Financial Advisory Committee on the panel? If he couldn't fix it then, how can he now? As a former councilmen/mayor, he helped put us in this situation? He's there to ponder these mighty matters, sigh deeply, and then declare, "We have no choice but to recommend taxes be raised. There is no other war to do this." Mickey does not ponder. He just strokes his own ego. Maybe he will surprise us and do the right thing for Arcadia. LOL. Jessica Louie is on the Arcadia Financial Commission. She is sharp, cannot be bought, and is the one I trust the most. Hopefully, she will see the bloat in the proposed budget and will take on the dragons of deceit. Go Jessica! Jessica Louie is the exception. The rest are expected to provide cover for the city. You're wrong as usual. Arcadia owes CALPERS $121 million not $613 million. $613 million is the total amount of future benefits. So who is paying that $613 million, Cranky Pants? Elves? Since when are future benefits not a threat to the financial health of our city? I MIGHT be willing to vote for new taxes if the city makes real cuts across the board. Not gonna happen? Sigh. A few years back Sierra Madre conveined a group of citizens to work on ways to keep services up without any scale back. The first night sitting together in the CC chambers, then Director of Public Works, Bruce Inmann, as their staff liaison, laid out the directives: no scaling back of any services or salaries just find a way to get more money from the residents. My husband said they should have all gotten up and walked out. Oh come on. $613 million for what? What do residents get in return besides a kick up the wazoo. Name anyone working in private sectors that get those types of benefits, unless you are a lobbyist or politician. 11:56am and once again, what have "we" got to show for that money city hall was raking in? With all of the oiling of the squeaky wheels in city hall, more should have gone to jail. It does not pass the "smell" test. The budget appears to have many "bloated" items (especially in capital improvements) to make it look like the situation without new taxes will result in Arcadia becoming a third world city. Scare people with stories of doom and gloom and a city taken over by ravaging criminals. Frankly, I might be sympathetic to voting yes on a sales tax if the budget presented is open and honest and "real" cuts have been made. Maybe dump CalPers? So far open and honest seem to be left out of the equation. Karma. Early release prisoners program may have a benefit after all. The retiree from government agencies will be targeted for their enormously large retirement payouts. That would be justice well served. The Library Board has yet to explain what they did with all the money, check the city agenda under warrants, over these many years. Where was that money spent ? "Cranky Pants" doesn't want to jeopardize his six figure retirement bonanza so he spins Arcadia's CalPers debt. $613 million is $613 million any way you slice (spin) it. What this means is the eventuality of an increase in resident's taxes are highly likely and they will be significant. The San Gabriel Valley is well known as the locus of illegal money laundering and Arcadia is the hub. The hub needs more taxes and a new city hall to keep up their image. The illegal looks more legit if they operate in opulent quarters. Really? Five "qualified" people on the financial committee? One is Tommy T. Chandler's campaign manager. The one who likely masterminded the fear mongering and character smears. No finely tuned financial skills in this fellow. Clearly in camp with realtors and developers. His role is to repeat his dirty and race based election tactics to fear monger residents to vote for new taxes. Imagine, to top it off the council wants to build a new mega city hall and ask for a parcel tax to fund it. After all, Arcadia's overpaid employees deserve a castle city hall that matches their wages and retirements. Tommy Thai, one trustworthy fellow...as I choke on my coffee. More Liberal and Socialist policies = More Taxation without representation and More of your Individual Money going to corrupt government which will spend and Waste that hard earned Cash. We Need Less Government and More Individual Economic Freedoms, Let the Free Market Work. We dont need more Regulations and More Taxes! Sorry friend - taxation without representation has nothing to do with being ‘liberal’ or ‘socialist’. And regulations have nothing to do with taxes. Rick Gates Admits Embezzling Money From Manafort’s Company To Finance Affair. The former Paul Manafort aide admitted to the extramarital affair in court Tuesday. So, you are saying that Rick Gates embezzled money to pay for Bill Clinton's extramarital affairs. So true, the tyrants on the Sierra Madre City Council have chosen not to represent the residents of this town. Whatever happened to the FPPC investigation into Sho Tay? Or the 20 people that voted illegally from the disgraced former Arcadia CC member Jonny Gemcoins home? influence this stall ? Understaffed employees who are qualified to track complaints? Disheartening. The only way to resolve the problem is out source 59 percent of work and laid off 59 percent of city workers. If 60 percent of city employees not working on every other Friday and leave early on Thursday. Time to cut them off the payroll. Raising tax will only save city for less than 10 yrs. 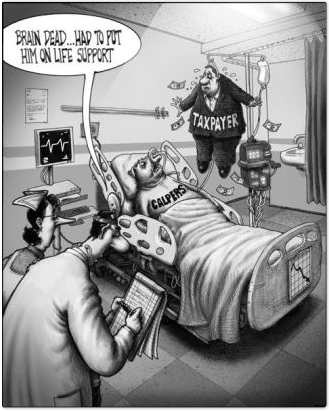 After that you will be looking forward to pay for another tax increase. Time to sale your house and leave those money hungry people. Have you seen how long the break and lunch your city employees taken? According to several coffee shops and restaurants employees, 1 hr break and 2 to 3 hrs lunch.